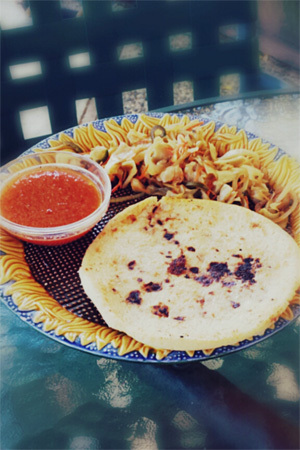 Pupusas are stuffed tortillas that are very popular in El Salvador. We have two options for stuffing—bean and cheese or zucchini and cheese. Serve with my recipes for salsa rojas and curtido for an authentic meal full of flavor. *Masa harina is a dried corn dough that can be found in Latin supermarkets. ** Shredded mozzarella cheese works well in pupusas. Other choices include quesillo, queso fresco and Monterey Jack cheese. Combine the masa and salt in spacious bowl. NOTE: If the dough becomes too moist, work in one additional teaspoon of masa. Repeat until the dough reaches the proper consistency. Cover the bowl and let dough rest for 15 minutes. Combine the beans and cheese in a bowl. Mix well and set aside. Squeeze all excess moisture from zucchini and discard. Combine the cheese and zucchini in a bowl. Mix well and set aside. Moisten hands and scoop out a 2-inch piece of dough. Roll into a ball. Using your thumb, press an indentation into the ball to form a small cup. Place a tablespoon of filling in the indentation. Do not overfill. Fold the dough over the filling and seal.NOTE: Continue to moisten your hands throughout the process or your dough will stick and become unmanageable. Pat back and forth between your hands until your pupusa is about ¼-inch thick. Repeat until all pupusas are completed.NOTE: If your pupusa tears, patch with a piece of masa and smooth out. Pour the vegetable oil into a large skillet set over medium-high heat. Once oil is sizzling, add the pupusas. Avoid overcrowding. Cook 2-3 minutes or until brown. Adjust heat to prevent burning. Flip and cook the other side until brown. Plate with a side of curtido and salsa rojas. This is a traditional salad similar to sauerkraut or kimchi. Enjoy as a side or serve with cooked pupusas, which are thick corn-stuffed tortillas popular throughout Central America. This Salvadoran dessert is easy to make and taste a bit like pumpkin pie. Concerba de Calabaza is traditionally prepared in a clay pot, but any pot in your kitchen will do the trick and achieve a deliciously familiar treat. The Cobb Salad originated in the 1930’s at the Brown Derby restaurant in Los Angeles. Refreshing yet satisfying, it’s been a lunchtime staple ever since. My version gets extra flavor from creamy blue cheese dressing.